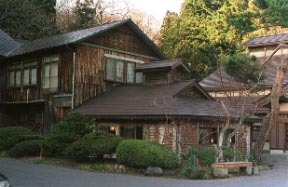 The wooden isolated lodge built in the primeval forest called the Towada ocean of foliage.It is an inn which there are a main building using a local wood Harigiri and wood named Sen, and a zelkova and a new building of after construction and a steel rod also without between, and a desire-for-the-real-thing and city group can also satisfy.Especially the main building has left the old air which has a cashier and in which the clerk is as it is.It seems that the bath boldly using a beech Log is built by the bathtub on the fountainhead, it cannot say not at all, but it is comfortable and all strength escapes from the body the moment a hot spring wells ups and goes up from the gap between framing tables with a foam.Aomori Khiva was used for bath structure and the strong smell is emitted.For meiji 42 years, first Shiro Ogasawara will inaugurate an enterprise. 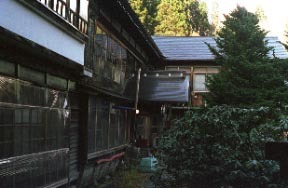 The main entrance of the Taisho 7 Structured. 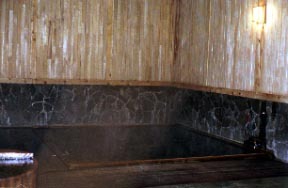 The yuya of "the hot spring of the Kyuan era." A high ceiling, the Aomori Khiva structure. They are seasonal foods by a season.The Hachinohe port and the Aomori port of seafood are fresh at that of an enough in about 2 hours. Old wings are 12 excepts, such as a grilled on porcelain. Special dish: They are natural maitake mushrooms and current price in autumn. A Hittsumi and raw horse meat are from the 3 public. Meal place: Suppers are a room and a restaurant of the first floor.Breakfast is a restaurant of the first floor. All of three baths are made on the fountainhead, and they are the noted springs which a hot spring wells ups and goes up from the gap between the framing tables of a beech. 100% of the fountainhead, free-flowing hot-spring water. Up to the Towadako Onsenkyo bus stop. * When you take a bus from JR Hachinohe station, please telephone.